In the Super Bowl back in February 2009, the Cardinals couldn’t stop Steelers QB Ben Roethlisberger when it counted the most. Three seasons later, not much has changed. 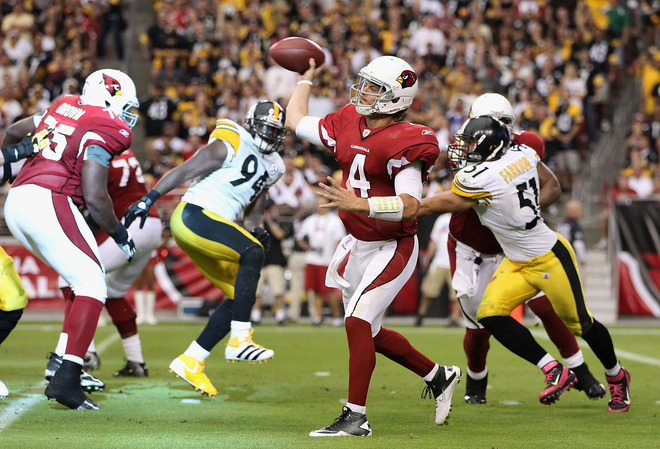 Roethlisberger threw for 361 yards and three touchdowns as the Steelers rolled to a 32-20 decision over the Cardinals, sending them to a 1-5 mark, losers of five in a row. Roethlisberger completed 26-of-39 pass attempts, including a 95-yard touchdown to Mike Wallace. Wallace caught three passes for 118 yards and Antonio Brown added seven grabs for 102 yards for the Steelers (5-2), winners of three straight. Kevin Kolb went 18-for-34 through the air for 272 yards, two touchdowns and an interception. Larry Fitzgerald caught four passes for 78 yards, while LaRod Stephens-Howling racked up 76 yards and a score on two catches for Arizona. Kolb was intercepted by Ryan Clark inside Arizona territory on the fourth play of the game and the Steelers used the favorable field position to take the early lead. A 16-yard catch by Brown moved the ball into the Cardinals’ red zone before Roethlisberger found Heath Miller for a 12-yard touchdown less than five minutes into the opening quarter. Each team then traded punts until the Steelers took over on offense at their own nine halfway through the second quarter. A false start penalty moved them back to the five, but Wallace hauled in a pass deep down the right sideline on the first play and outran two defenders on his way into the end zone for a 95-yard score. It was the longest touchdown pass in Steelers history. Arizona answered with a 13-play, 80-yard scoring drive to make it a 14-7 game. After driving into Pittsburgh territory, an illegal contact penalty on the Steelers on an incomplete pass on third down kept the drive alive. 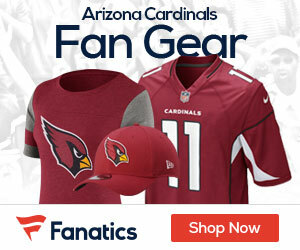 A defensive holding penalty on another Kolb incomplete pass on third down kept the ball in the Cardinals’ hands and Alfonso Smith capped the drive with a one-yard run into the end zone. Shaun Suisham’s 41-yard field goal as time expired gave Pittsburgh a 17-7 lead at the half. Pittsburgh was forced to punt on its first possession of the second half and Arizona quickly made it a three-point game when Kolb hit Stephens-Howling on a short pass across the middle and the running back raced 73 yards down the right sideline for a touchdown. But the Steelers marched right down the field to cushion their lead again. Miller hauled in a 17-yard catch to move Pittsburgh across midfield and Brown’s one-handed grab at the sideline netted 13 yards before Roethlisberger hit Emmanuel Sanders in the back of the end zone for a four-yard touchdown. Kolb’s intentional grounding penalty in his own end zone gave the Steelers a safety, and Suisham’s 42-yard field goal on the ensuing drive put Pittsburgh ahead 29-14 with 11:25 left in the game. After Suisham split the uprights from 39 yards out, Arizona worked its way 71 yards down the field in 11 plays, resulting in Early Doucet’s two-yard TD catch. Kolb’s throw on the two-point conversion was too high and it sailed out of the end zone to make it a 32-20 game with just under four minutes remaining. Arizona opted not to try an onside kick and Pittsburgh was able to run out the remainder of the clock to lock up the game. Next Sunday the Cards travel to Baltimore to play the Ravens.